The beautiful light sapphire lucite beads are about 16mm in diameter, and have the rose blooms moulded into both faces. I've alternated them with round 8mm disco-cut sapphire crystals. 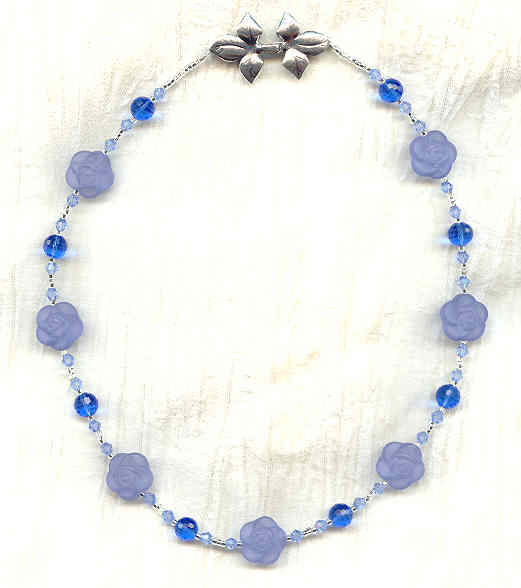 Both the lucite and disco-cut crystals are flanked with 4mm light sapphire bicone crystal beads, and spaced with silvery seed beads. The 18" strand closes with a substantial sterling silver hook set. This floral fantasy is brought to you by SPARKLE PLENTY, of course! The fabulous moulded acrylic roses are from the 1950s, and are about 16mm in diameter, with the roses showing on either face. Each of the rose-coloured Czech lampwork beads has been hand made over an open flame.